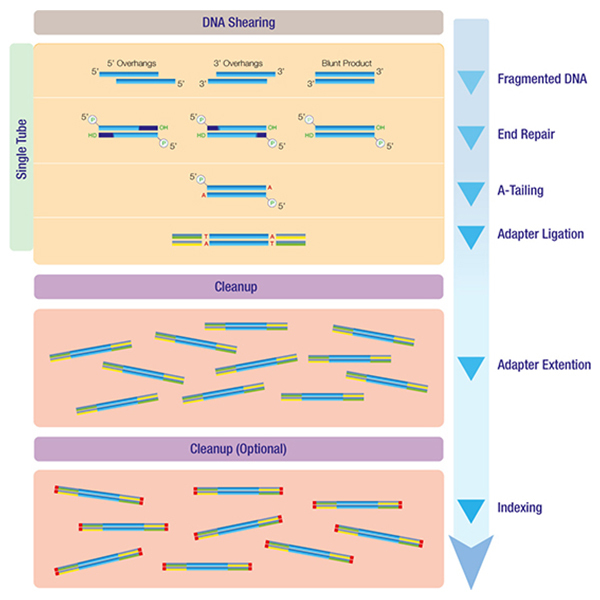 Bringing high sensitivity, speed and efficiency to next generation sequencing (NGS). The JetSeq Flex DNA Library Preparation Kit contains all of the enzymes and buffers necessary for end repair, A-tailing and ligation in a convenient, optimized formulation. JetSeq Flex also includes the polymerase and buffer components required for PCR amplification of the library prior to sequencing. JetSeq Flex is optimized for use with sequence adapters compatible with Illumina® instruments, allowing indexing of up to 96 samples. Select the best reagent for your research based on your library preparation requirements. We have started building a collection of short written and video reviews that we share online with the research community. Would you like to share your experience of JetSeq Flex as part of our new customer review program? The JetSeq ER & Ligation Kit contains all of the enzymes and buffers necessary for end repair, A-tailing and ligation in a convenient, optimized master mix formulation. This kit is recommended for NGS applications that do not require PCR amplification of the library prior to sequencing. JetSeq ER & Ligation Kit is optimized for use with sequence adapters compatible with Illumina® instruments, allowing indexing of up to 96 samples. Accurate quantification of the number of amplifiable library molecules loading onto the flow cell is a critical step in the NGS workflow in obtaining high-quality read data. The JetSeq Library Quantification Kit provides all of the components, including JetSeq FAST SYBR® mix, primers and DNA standards of known concentration to allow quantification of library DNA. JetSeq Clean is based on paramagnetic bead technology, designed for efficient purification of nucleic acid fragments as well as a single- or double-sided size selection of libraries following the fragmentation, ligation and PCR steps in the next generation sequencing (NGS) library preparation workflow. We have started building a collection of short written and video reviews that we share online with the research community. Would you like to share your experience of JetSeq as part of our new customer review program?